The Benguela Brasserie at Mannings Heath Golf & Wine Estate incorporates a sophisticated South African link to its decor. With an open log fire for those cold winter nights and stunning terraces with views out onto the estate. 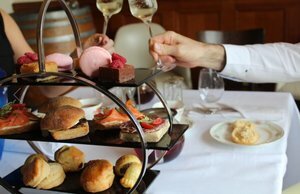 The Brasserie transforms itself from an open, relaxed lunchtime dining setting to an intimate atmosphere in the evening. It is the perfect place to relax over a delicious meal, with fine wine and great company. Nick McAllister has worked at top dining establishments across London, Surrey and Sussex and is well renowned for pushing the boundaries of ingredients. Benguela Brasserie in the heart of Sussex encapsulates Nick’s philosophy, high quality, creative dishes with a personal touch. Nick and his team have a passion for creating new menus that reflect the seasons, utilising the best locally sourced produce.